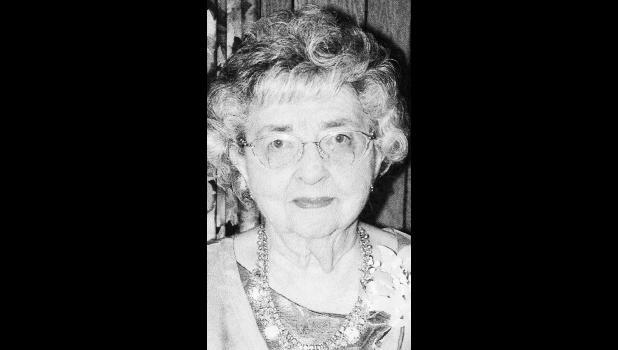 Dorothy Grace LaPlant Murphy, 96, of N2987 Hilltop Drive, Campbellsport, Wisc., went to her eternal reward on May 17, 2018, surrounded by her family at home. She was born on June 13, 1921, to Arthur and Cecelia Anna Croteau LaPlant in Walsh, Wisc. On June 1, 1946, she married Ambrose Murphy at St. Joseph’s Catholic Church in Walsh, Wisc. The couple farmed in the Town of Eden until 1956 and then operated Murphy’s Greenhouse for 35 years. Dorothy, a graduate of Marinette High School and Oshkosh Teacher College, taught at Ethan Allen and Woodside, rural schools. She was a 4-H Leader, Fond du Lac County Fair Superintendent for Needle Arts for many years, and a guide at the Galloway House in Fond du Lac. Dorothy enjoyed sewing, crocheting, knitting, singing, painting and writing as well as tending to flowers and garden plants. She was known for her baking and canning skills. She was a member of the Sons of Zebedee: Sts. James and John Catholic Church in Byron and the Altar Society. Survivors include her children, Michael (Molly Rose) of Lake Tomahawk, Wisc., Patrick (Annette) of Campbellsport, Wisc., Mary Dickens of Fond du Lac, Wisc., Daniel (Juanita) of Lomira, Wisc., Jane (John) Matusinec of Muskego, Wisc., and Helen (Boyd) Plankinton of Holton; a daughter-in-law, Sharon Murphy of Campbellsport, Wisc. ; 13 grandchildren, Kathy (Ronny) Cooksey of Albuquerque, N.M., Sarah (Tony) Lowe of Campbellsport, Wisc., Amanda Poole (Jimmy) of Hernando, Miss., Mindy Murphy of Lomira, Wisc., Stacey (Jeff) Stremke of West Bend, Wisc., Nathan Ewing of Lomira, Wisc., Megan Murphy of Kewaskum, Wisc., Andrew, Kate, Zachary and Daniel Matusinec of Muskego, Wisc., Kevin (Kate) Plankinton of New Lenox, Ill., and Kirby Plankinton of Topeka; 26 great-grandchildren; a sister, Joyce Johnson of Menominee, Mich.; many nieces and nephews; private nurse Anne Irish; and Dorothy’s little dog, Buddy. Preceding her in death was her husband, Ambrose, on Sept. 11, 2010; a son, John Murphy; son-in-law, James Dickens; grandchildren, Jamie, Casey and Christopher Murphy; her brother Francis LaPlant and his wife Eleanor; sister Cecelia Peterson and her husband Olaf; brother-in-law Oscar Johnson; brothers and sisters-in-law, John and Elsie Murphy, Leo and Agnes Murphy and Jim and Mildred Murphy. Mass of Christian burial was held Monday morning at Sons of Zebedee Parish, SS. James and John Catholic Church (W5882 Church Rd., Fond du Lac, Wisc.) in Byron. The Rev. Michael Petersen officiated. Cremation followed and private burial services will be held in St. Mary’s Cemetery in Eden.